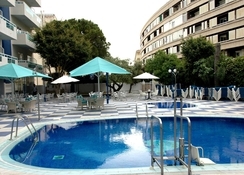 Santa Monica Playa is a family-friendly 3-star boutique hotel just 250m from the lovely beach in Salou and within a few minutes’ walk of the Town Centre. 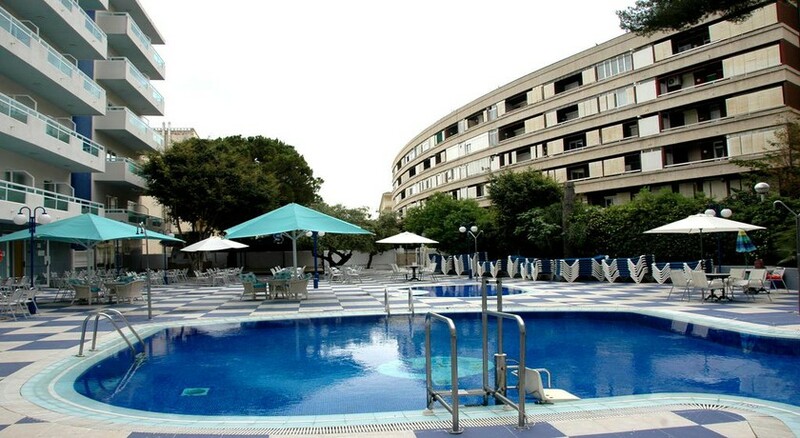 Equipped with modern guest amenities and a great location, this hotel promises a comfortable stay to its guests in the beautiful resort of Salou. Two swimming pools, sun loungers and lush gardens welcome the guests to retire in comfort at its 210 guestrooms. The units come with air conditioning (during summer), central heating, satellite TV, telephone, optional safety box and an en-suite bathroom. There is a private terrace offering lovely pool or sea views. Salou, located on the beautiful Costa Dorada, is a nice seaside resort preferred by families for its fine beaches and fun activities. Soak up all the sun you want on the small but peaceful Llenguadets Beach or potter around the watchtower Torre Vella. Take your family to a day of fun and thrill at the PortAventura Theme Park or stroll lazily about the Illuminated Fountains in the evening. 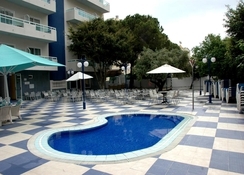 Santa Monica Playa Hotel is just 250m from the beautiful beach in Salou. The Town Centre and ludic area are few minutes’ walk away. The House of Illusion stands 1.3km away, whereas the bustling resort of PortAventura is 2km away. The hotel is 10km to the historic Roman city of Tarragona. The Reus Airport is 12.6km from the property. Santa Monica Playa Hotel has 210 airy and well-appointed guestrooms that come with contemporary décor and come with satellite TV, telephone, air conditioning or heating, en-suite bathroom with hair dryer. The non-smoking rooms come in categories of twin room, triple room, two adults & two children room, single room and single parents room. 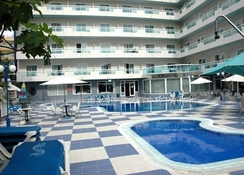 The rooms have balconies which offer lovely pool or sea views. 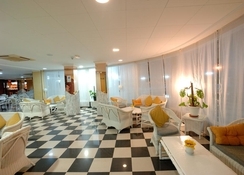 The hotel has a buffet restaurant where delicious local and international cuisine is served. During summers, a special buffet for children is available. Packed lunches can be ordered on request. The hotel has a bar where guests can relax with a cocktail during the evening. 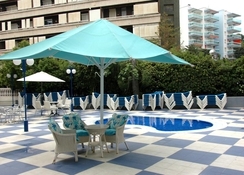 The hotel has a large outdoor pool and a sun terrace where guests can soak in the sun. Darts, table tennis, billiards can be played on premises which also has a game room. There is free Wi-Fi in public areas and a shared lounge where guests can catch up interesting programs on TV. The hotel offers entertainment shows, bicycle hire, a ticket and a tour desk. For the kids there is a playground. We have stayed here twice now and both times had really good stays, the first stay was faultless, our stay this year we was placed in rooms next to some guys who certainly give brits a bad name, leathered before the flight and roudy, 4 ladies in 2 rooms we requested a move and the hotel couldn’t have been more helpful the immediately moved us away and we certainly enjoyed our stay a lot more! Food was fine don’t get me wrong it’s not 5* but was always something nice and hot and very fresh! Hotel was always clean and tidy beds were made daily and the pool was fine! Entertainment was a young lad called Carlos he was hysterical and took the time to speak to everyone as much as he could! Bingo was hilarious as he is Spanish trying to read English numbers!!!! We stayed for four days and totally enjoyed the beautiful seaside town, weather, food, long sandy beach, and many more. The hotel has been well equipped with many entertaining facilities, including a large delicious buffet restaurant, located right close to the beach, what else could we ask for a enjoyable holiday like this.